Blade Magazine presented Columbia River Knife & Tool with the 2009 Most Innovative Imported Design award, earned by CRKT's Flux knife and tool combination system. Whether your frontier is the city or the country, you'll find a useful combination to tailor to your own pursuits. Although the Flux tools can be purchased as individual folding clip tools -- including separate LED flashlight, knife, flash drive, and more -- the most economical setup is the double rail system with two tools. The CRKT GoWork package includes the double rail with two carabiner clips for hanging the tool pack on belt loop or pack. While the carabiners aren't meant to support much load, they're sufficient to keep the tool pack at the ready. Slide off either tool when needed, leaving the rail on your gear. When finished, slip the tool back on the rail, and it locks securely in place again. The GoWork pack includes the Flux knife and Flux driver. The Flux knife is a lightweight folding lockback with high carbon stainless steel 2.25-inch plain edge blade. 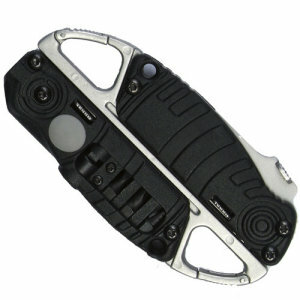 The clip point blade opens one-handed and snaps into open position with a sturdy liner lock of stainless steel. If you choose to carry the pocket clip folder without the rail, use the stainless steel pocket clip which screws easily to the knife's grip. The other half of the GoWork pack is the Flux driver tool, which includes one Phillips head bit, two flat screwdriver bits, and a single LED light to illuminate those dark mechanical corners. Customizing is simple. Flash drives, wine tools, and a more powerful 2 LED flashlight are available as individual tools and may be switched out at will. Buy either the GoWork system, GoNerd pack, or GoPlay pack for a pre-selection of appropriate tools, and add to the collection when a change of scenery is due.